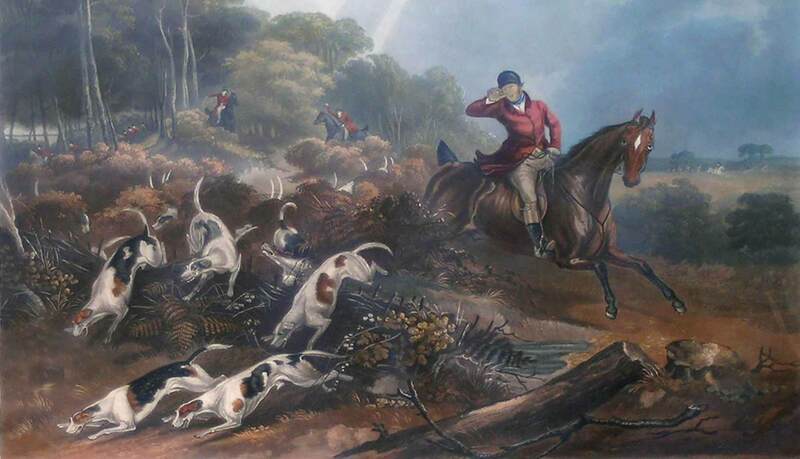 The six hound dogs in The Fox Chase are very similar to the dogs that are featured in each of the English prints by E.C. Turner that hang above the fireplace. 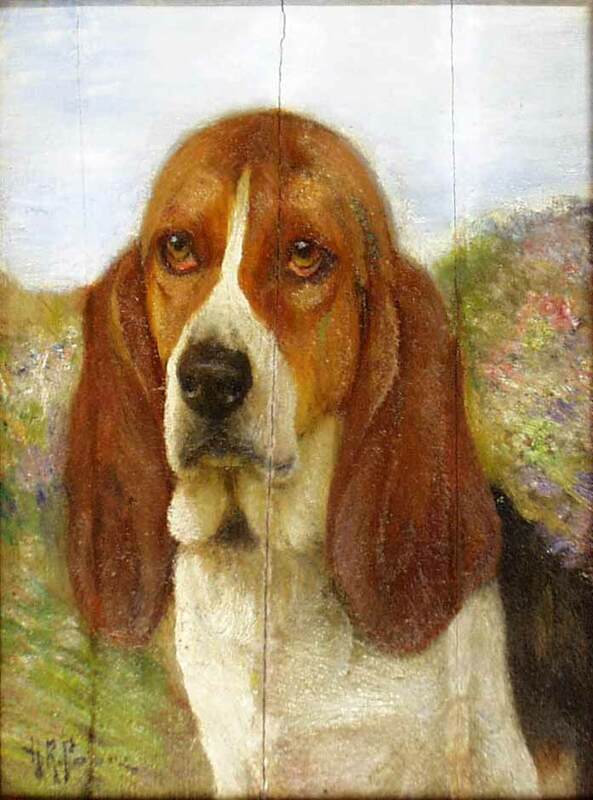 Such a fan of the hunt was The Fox Chase artist Henry Rankin Poore that he even painted wood panels of dogs chasing a rabbit, to be attached to the outside of his car. One of the four framed hunting prints in the Griswold dining room. Despite Miss Florence’s fondness for cats, the artists seem to favor dogs as their companions. 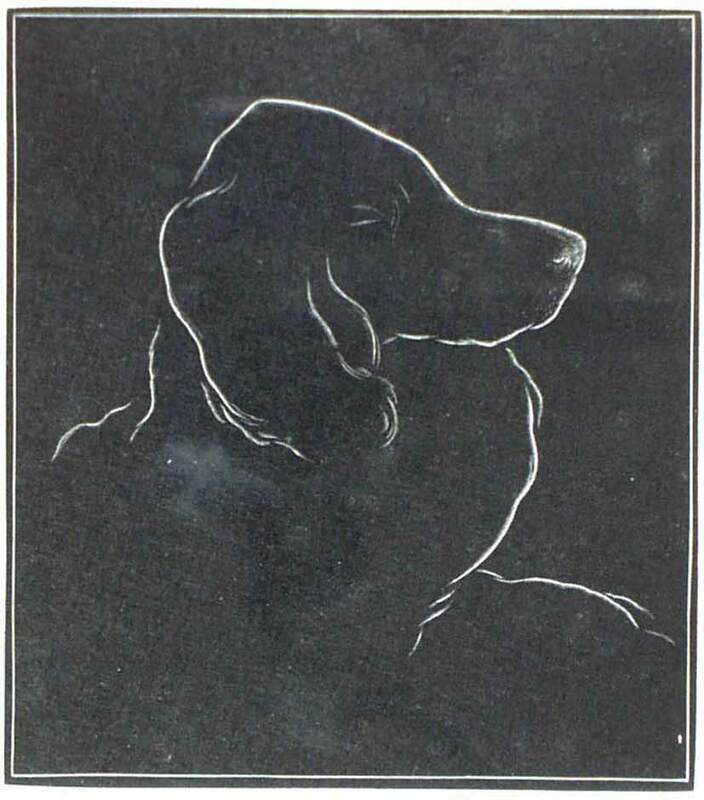 Several artists used their dogs as subject matter, and Poore produced several formal portrait of his dogs. 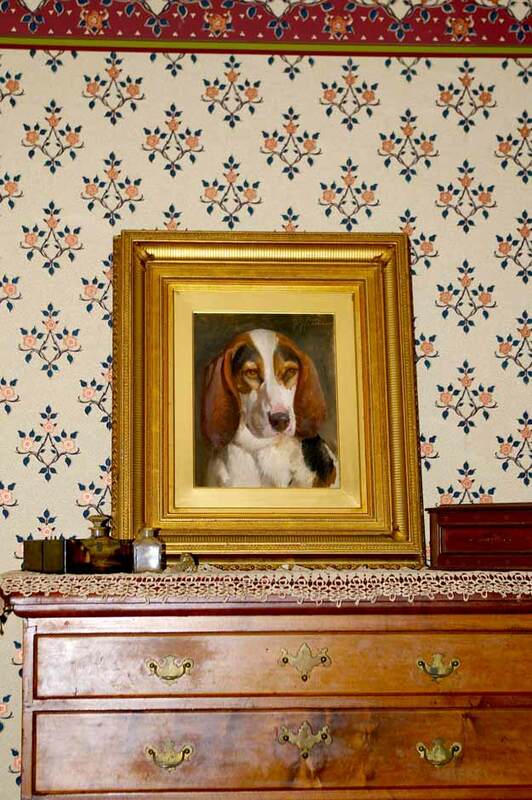 Dogs also play a role in several of the painted panels and doors in the house. 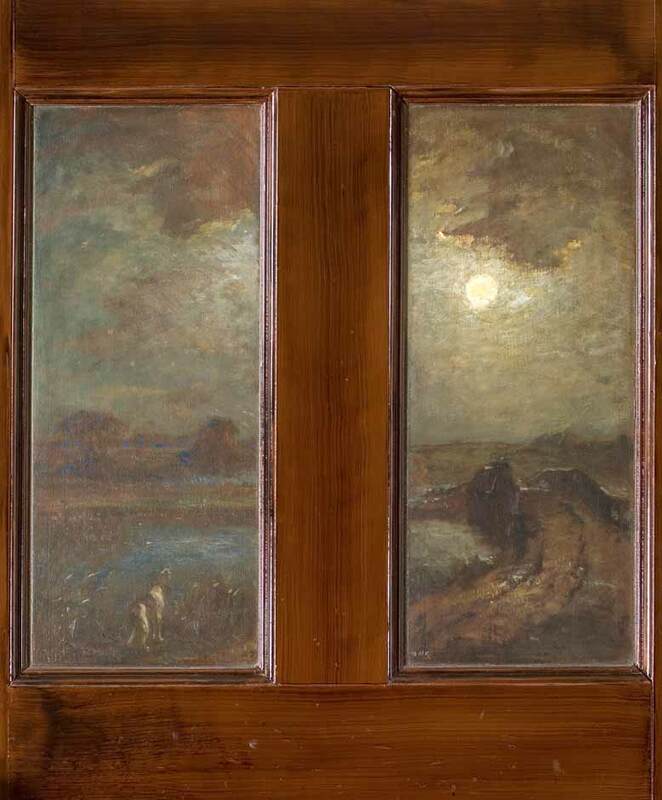 In 1900, Poore was challenged by art colony founder Henry Ward Ranger to paint a scene on the left panel of the door leading to the Art Colony Bedroom. It was to match Ranger’s moonlit scene of the Bow Bridge on the right panel. 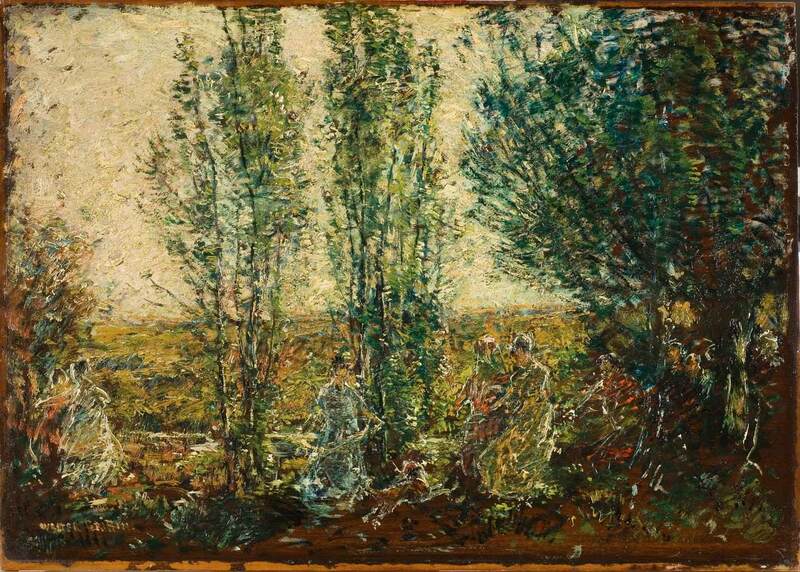 Poore mastered the task by painting a continuation of the scene. He extended the road to the bridge and the river and dappled them with bluish moonlight. He then placed his dog Beau at the bottom, howling at the full moon in Ranger’s panel. 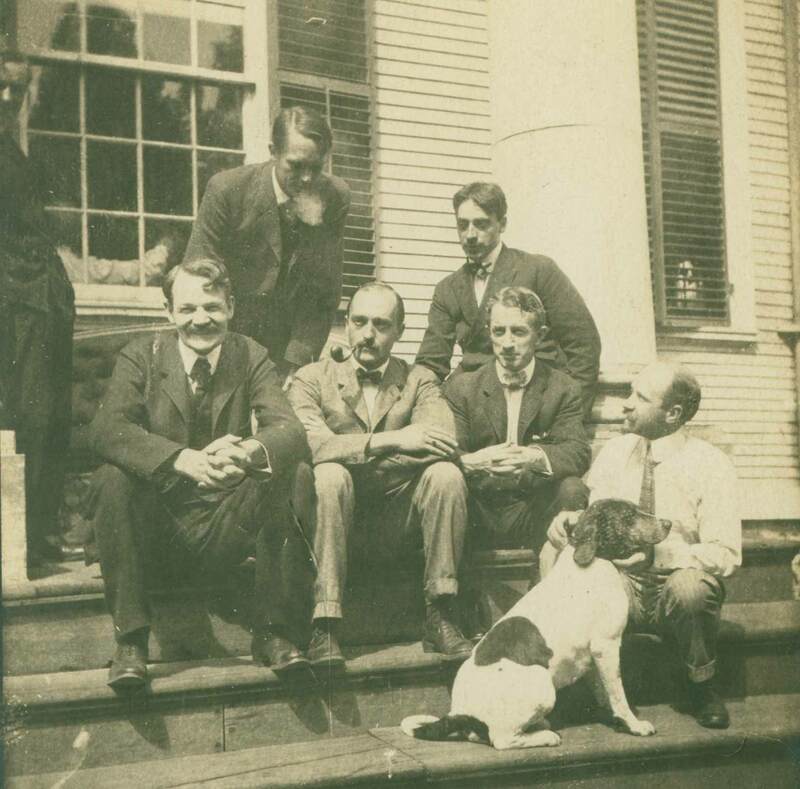 Poore also included Weeksie, a dog belonging to William Henry Howe, sleeping near the figure of Childe Hassam in The Fox Chase. After Weeksie died, however, the image of him in the panel made Howe too sad to eat. As a goodwill gesture for his friend, Poore painted over Weeksie, turning him into a boulder. There is one other painted dog in the dining room in Walter Griffin’s panel Ladies in the Woods. 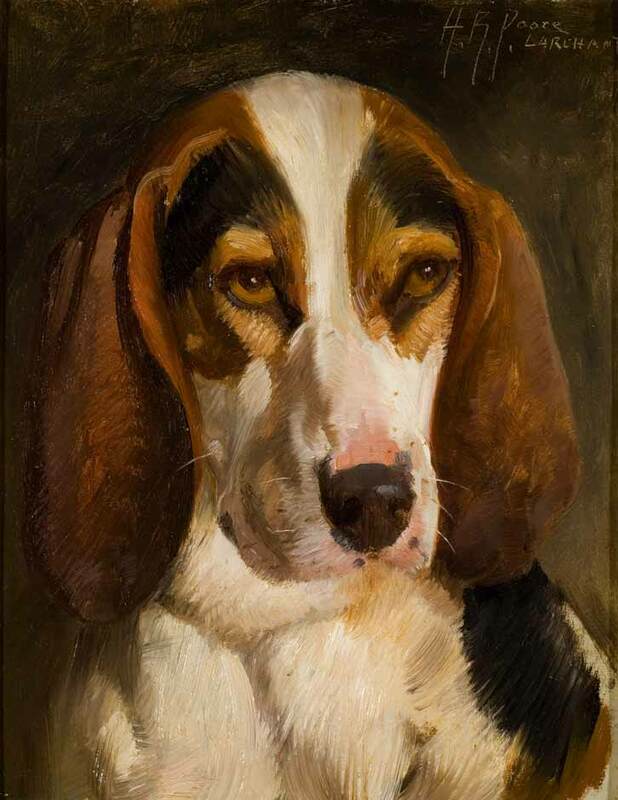 Although not featured in The Fox Chase, nor represented by a panel in the Griswold House, the artist Percival Rosseau (1859-1937) was a leading painter of dogs who lived on Grassy Hill in Lyme. His friends in the Lyme Art Colony encouraged him to buy a pre-Revolutionary-War house in the area. He became active in the Lyme Art Association and would show in the annual exhibitions in town. 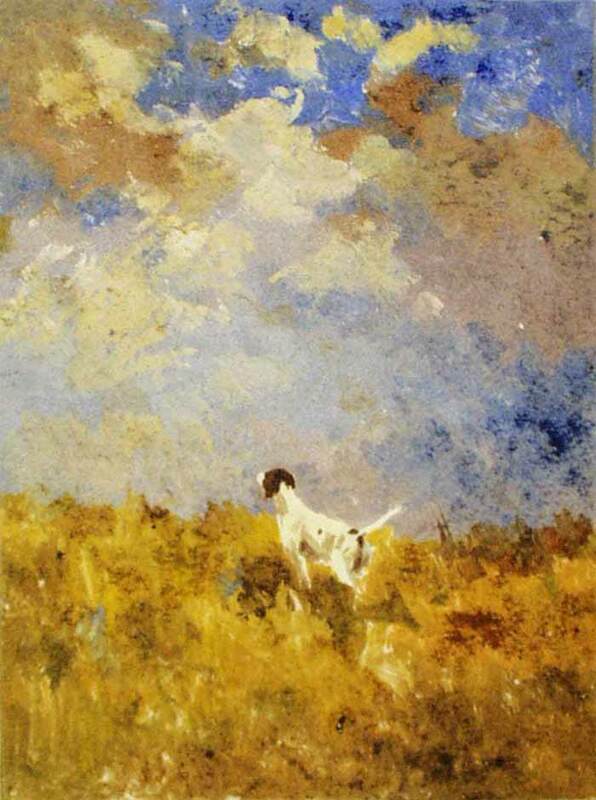 Rosseau had annual exhibitions in New York at prestigious galleries and devoted his work to the two most popular breeds of hunting dogs — the English setter and the pointer. 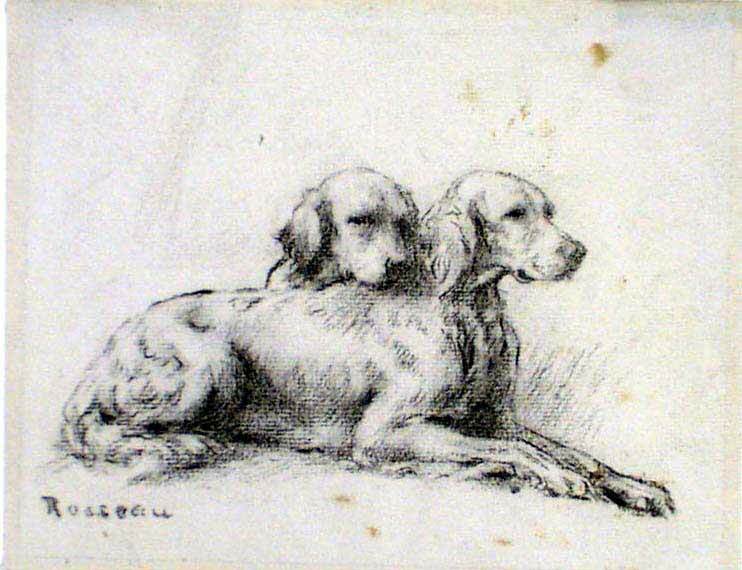 Next to his studio in Lyme he kept a kennel of five or six dogs. A man should paint what he knows best, and I know more about animals than anything else. I have run hounds from childhood and have at my fingertips the thorough knowledge necessary to picture dogs faithfully.